Canada's foremost environmentalist, teacher and filmmaker David Suzuki was in Knowlton as part of his cross-country book signing and speaking tour. Brome Lake Books (264 Knowlton Road) with it's charming wooden decks overllooking the Mill Pond Dam and park was the perfect venue for welcoming Mr. Suzuki in warm Townshippers fashion and Saturday was a warm and sunny day and the cozy atmosphere of the bookstore was highlighted by a calm breeze and the buzzing of bees in the afternoon. The book signing had an air of relaxed excitement as people began arriving early to have books signed and chat with David who sat a simple wooden desk at the rear of the store. David posed for pictures and spent time with everyone to chat and really made an effort to connect on some sort of personal level with everyone who was there. 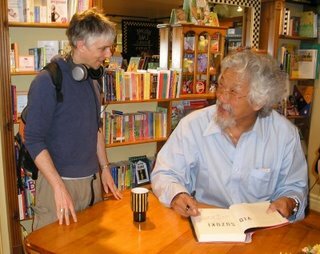 One resident had actually seen David Suzuki speak 25 years before when he was in 9th grade at Sir John Franklin High School in Yellowknife, North-West Territories and as he had his book signed thanked David for being such an inspiration to him throughout the past quarter-century. David said lightly that there was quite a difference between Yellowknife and Knowlton! He's right about that but the encounter demonstrated how people like David Suzuki can really make an impact on people and actually change things for the better one person at a time. The evening event at Arts Knowlton was sold-out well in advance and while none of us from Destination Knowlton could get tickets it goes without saying that Mr. Suzuki will have certainly touched more people at his evening speaking engagement. Surely his message of world connection and concern with the environment will be passed on again to a new generation just as he did to one resident of Yellowknife 25 years ago who now lives in Knowlton. David Suzuki is a scientist who has spent his life educating and fighting for the environment and the health of the planet. His CBC series "The Nature of Things" is an internationally renowned series that has brought environmental issues via documentary film into the hearts of minds of Canadians for decades. He continues his push for sustainabilty and protection of the planet and on his website offers ideas and solutions for a small planet. Currently he invites us to join the "Nature Challenge"